The Garden Writers’ symposium in Pittsburgh was a great event but I must admit that I’m always glad to get back home. We saw some wonderful gardens but I realize that I have been doing this too long. I think I have become a bit jaded after seeing so many different gardens over the years and it takes something pretty special to get me to raise my camera. A quick look says that I only managed to take about 250 pictures over the four days of touring. Many of those are just lazy record keeping; take the picture of the plant and then take a picture of the label next to it, that avoids the use of pencil and paper. That’s one of the joys of digital photography, the minuscule cost per picture. I showed you the Tillandsia arches at the Phipps Conservatory last week and there was much more to see there. They have the typical large Palm house that you enter through and then a wide variety of smaller, themed glasshouses. One of their main contributions is their efforts to make their whole operation energy efficient. That’s difficult with a greenhouse but they try. Deep holes in the ground are a source of cool air that they pump through their main glasshouses in the summer and that is quite effective and much cheaper then trying to use conventional cooling systems. They recycle most of the rain water that falls on their buildings and their newest building even has a waste water recycling system through a series of created wetlands. 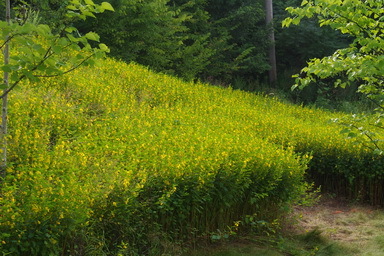 The plant that attracted most attention from our group was outside covering some steep slopes with a mass of bright yellow flowers and some very delicate foliage. 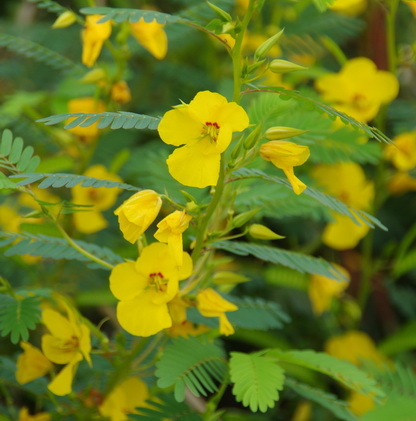 Eventually we found one of our group that identified it as Partridge Pea, Cassia chamaecrista a native of the area that is an important plant for erosion control and whose seeds are a major source of food for groundbirds such as partridge and grouse. 350+ garden writers looking at acres of exotics and a local wild flower caught the attention of many of them. The Assistant Gardener had done an excellent job of keeping everything alive and she did her best to keep the Tomato and Cucumber harvest under control. Many of the weeds managed to elude her but the garden was still a very welcome sight upon my return. 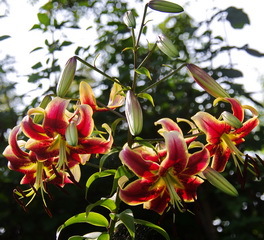 A few very late Lilies were in full bloom and they continue to brighten up the fading garden. The various types of Lilies have been supplying gorgeous blooms and food for the Red Lily Beetle for most of the summer, reinforcing my love affair with then and the justifying the constant battle with the Beetle. The picture is of a fairly new hybrid whose label has gone for a wander. It appears to be an Oriental hybrid of a group know as Black Beauty and this variety may be Scheherazade, at least that sounds vaguely familiar. Its mid August bloom with large recurved flowers on tall strong stems, certainly make it a stand out in the garden. It has a single stem this year and I’ll eagerly await next year to see if it multiplies. Its late arrival and heavy foliage also make it less likely to be a target of the dastardly Red menace. One should never leave a summer squash planting for a week. Small plants with many bright yellow blooms turn into giant triffids covering the walkways and holding a wealth of overgrown fruit. Zucchini and her cousins have an amazing growth rate. On Monday they are small, delicate vegetables and by Friday they are baseball bats capable of being made into an infinite quantity of Zucchini bread. 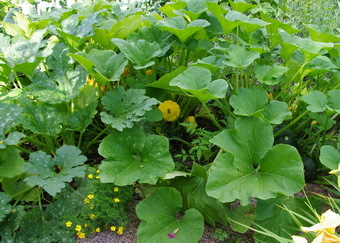 I have round Eight Ball types, long, ridged Romanescu types, scalloped Patty Pan types and a couple of colours of ordinary Zucchini, all of which now own the garden and make me question my sanity for having planted so many in the first place. I must get out there and pick all of the overgrown fruit so that they will continue to produce the small succulent new ones that are wonderful for grilling or stir frying. A couple of the large types will make it to the table as stuffed Zucchini but you can’t eat that every night either. Neighbours and friends should keep an eye out for baskets on their doorsteps. Richard Asks? A short question this afternoon. As I was walking around my Rose of Sharon and my small climbing rose bush, I noticed a brown/green type beetle (some on top of each other!) in the flower eating the petals!!! What to do???? Ken Answers! It sounds like the nasty Japanese Beetle has discovered your garden as it has mine in the past couple of weeks. Constant vigilance and hand picking are the best deterrents. There is very little we can spray that has much effect. There are traps that catch yours and attract your neighbours as well. I will be looking for other ideas now that I also have them and will publish as I learn. Sandy Asks? I have a question about a worm that is hidden in a hard shell under the leaf of a rose bush in clusters small hard pea size balls. They can be pulled off and when you split them there is a a little worm inside there could be ten in a cluster along the branches. This rose bush is in Oakville and has not spread to the other 24 bushes yet. Ken Answers! Your description leads me to two possibilities. There are a few Scale insects that attack roses and one of them sounds similar in shape. There is also a rose gall that develops into little round balls. Try looking those up to see if any look like your problem or send me as close up a picture as you can. Mary Asks? what's with all the basil (thai and sweet) turning black, brown this year?? I've planted three batches of thai basil - two pots of the third batch are gone again - the third pot (planted with other herbs) seems ok - for the moment...any ideas? too hot? too wet?? some kind of fungus this year for the basil?? Ken Answers! My basil all turned brown, seemingly overnight, as well. My research can find no ready answer. Basil is particularly sensitive to cold so it could be that we had an unusually cool night or two. Mine seems to be continuing to to grow and the new growth has not turned brown so it's probably not a disease. Bonnie Asks? Why are the leave's on my geranium turning bright red? Too much sun..lacking fertilizer? Ken Answers! Red leaves on geraniums is a sign of stress and almost any stress will do it. Lack of water, lack of fertilizer will both cause the problem. If you are watering regularly then it's probably a lack of fertilizer.